Leucanthemum vulgare is an iconic perennial flowering herb that is native to Europe but can be found all over the world. It’s also called the dog daisy, common daisy or moon daisy and can be seen in fields, woodlands and along roadsides. It has serrated to dentated dark green leaves and spreads via rhizomes. I have a large patch of this in my rabbit forage field and the bunnies always go for these juicy stalks first when they get their daily bundle of wild grasses. The dead nettle has died down for the most part and so the oxeye daisy makes for much of their non-grassy forage this time of year, now that it is getting hotter. The young leaves of this herb can also be used in salads, and the dried leaves have a bitter and tingling flavor similar to that of valerian. The immature flower buds can be marinated and used like capers, which is what I’m preparing today. They have a unique, delicate sweet and spicy flavor that complements many dishes such as smoked fish, salads, pates and sauces. You must select tightly closed flower buds to ensure the best flavor and that no bugs have made their way in. Then take 1/2 cup apple cider or wine vinegar and 1/2 cup water mixed with 1 tablespoon sea salt and use to cover your flower buds in a glass jar or ceramic crock. Refrigerate and they will be ready to use after three days but will keep in the fridge much longer than that. Some of you may remember Fred, the stray cat who showed up here a few months ago in rough shape. Well yesterday Fred was doing the litterbox shuffle, going from one box to the other, only able to urinate a dribble each time. He still seemed frisky and cheerful so I decided to give it a day. He was back at it today so I scheduled an appointment with my vet. I brought him in and after a urinalysis, he was diagnosed with a raging bladder infection and pee chock full of struvite crystals. Poor Fred. He was given a shot of strong antibiotics and I was told that he needed to go on a special diet. Uh oh, here we go. Ironically, as I had been waiting for the results of the test, I had been noticing that all the posters and infographics in the vet office had been sponsored by pet food companies. 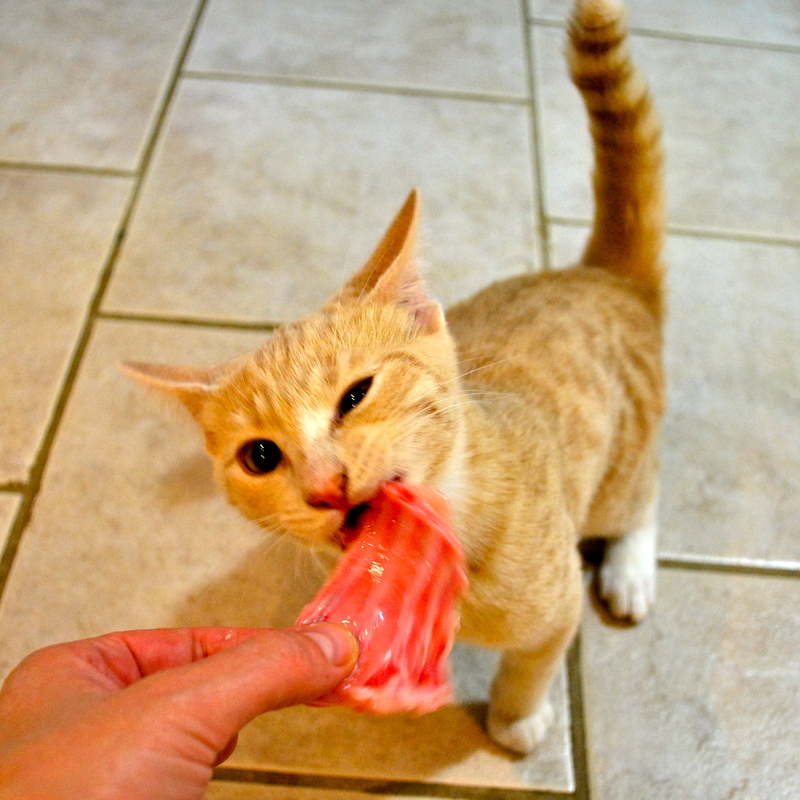 If you’ve been reading my blog, you may know that I try to feed my cats raw food predominantly. Of course lately I’ve been lazy and have been passing out low-carb kibbles and canned. My bad. When the vet said I needed to change his diet I knew what was coming. She said he needed to go on a special, very expensive canned diet that could only be purchased from a vet. I asked her if there was a natural alternative to this food and she said very sternly, “NO”. So obviously then I asked if whatever was in the special diet was not natural? To that she had no response. Of course, once back at home, about one minute of online research later, I discovered that these special foods basically just have lowered ash and magnesium content, something which has actually been proven to have no effect on urinary crystals. The only thing proven to help with struvite crystals in the urine is increased water consumption. What a shocker. Why is there ash in cat food to begin with? And of course the best way to keep his urine acidified so it can properly dissolve the crystals is simply to feed a high-moisture content, zero-carb, raw diet. What a coincidence. I remember when I started feeding homemade raw, I felt a bit guilty. Was I being a bad cat owner? The vets seemed to think so. After having my three cats on raw for about a year, one hot summer my cat Parsley started drinking water. Normally she never drank water as she got plenty of moisture from the raw food. I was worried. I brought her in to the vet for full blood work. Of course he asked about her diet. I told him I made her a homemade raw diet and he looked at me like I was a poor deluded idiot. “What spices do you add to this diet?” he asked. Spices? I don’t add any spices. I make a species-appropriate prey-model diet based on what a cat would eat in the wild. Did he think I was serving them raw chicken with Italian dressing? He was unimpressed. 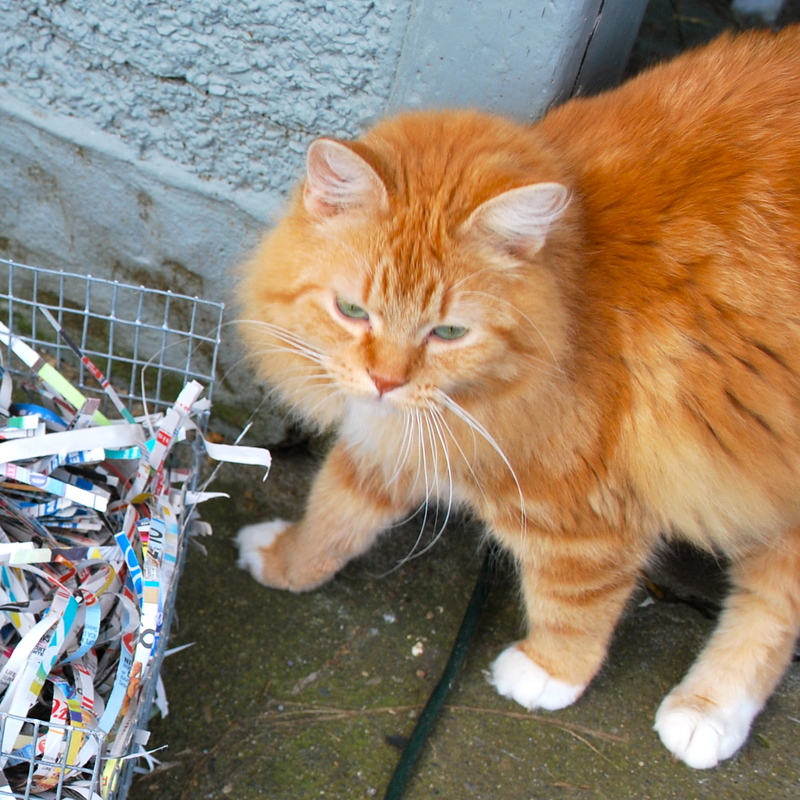 When he came back out with blood test results in hand he said, “This is one of the healthiest cats I have ever seen.” The next thing out of his mouth was “I still think you should switch her over to a commercially prepared diet.” Huh? And so this is how it has been with nearly every vet I have ever visited. A homemade raw diet is evil, you’re killing your cats, you are a bad owner, you should be ashamed. And yet I’m just not buying it. A feral cat would be eating a raw diet, and I myself don’t eat a “perfectly balanced” meal each day and somehow, I survive. I’ve heard anecdotally that vets get a few hours of training total regarding nutritional health of pets and that this “training” is highly influenced by pet food corporations. I myself have found that most vets are sorely misinformed when it comes to what kinds of foods are best for cats and dogs. They espouse high-carb kibbles and canned foods that probably ensure their patients will be returning for expensive treatments again and again. I’m sure most don’t do this knowingly, but that’s no excuse. Anyway. Around $200 later, I have a paper bag of very expensive tiny cans of cat food which list their first ingredient as water. I think I’ll just stop being so lazy and get everyone back on the raw food feeding regime. All I want are healthy cats, and I don’t mind a little extra work and expense to achieve that. I’m tired of being shamed, looked down upon and made to feel horrible for providing my pets with a fresh, raw diet that I know is good for them.